An award-winning moisturiser, beard balm, aftershave balm or hair styling balm. Can be used for women too, after shaving or for general moisturising. GREAT FOR: All skin types. For protecting, nourishing and conditioning your skin & beard. Travelling. Apply sparingly, a little goes a long way. An Award-winning Herbal 'ALL-IN-ONE MAN BALM' is a great way to benefit from the healing qualities of herbs and botanicals. Our 100% Natural, 90% Organic Vegan Botanically Infused Man Balm, is packed with softening & regenerative ingredients like Soapnuts, Cocoa Butter, Shea, Jojoba & Hemp. Easily absorbed and non-greasy. Because you can use it to moisturise your skin, beard and hair, it is great for travelling! With Bay, Lavender & Rosemary essential oils, this balm also has added anti-bacterial, balancing, anti-oxidant, toning and anti-inflammatory properties! 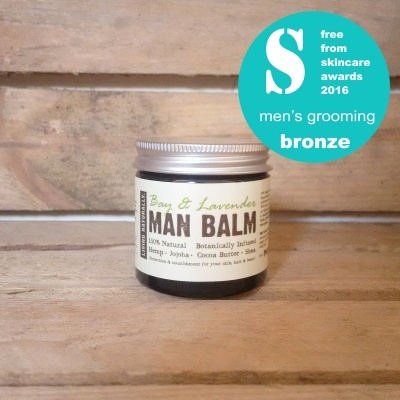 This won Bronze at the Free From Skincare Awards 2016 in the Men's Grooming Category. INGREDIENTS: Organic Helianthus annuus seed oil, Organic Simmondsia chinensis seed oil, Organic Theobroma Cacao Seed Butter, Organic Cannabis sativa seed oil, Organic Butyrospermum parkii, Euphorbia cerifera wax, Organic Sapindus mukorossi fruit extract, Tocopherol, Laurus nobilis oil, Lavandula angustifolia, Rosmarinus officinalis oil, Eugenol*, Limonene*, Linalool*. *Naturally occurring in essential oil.